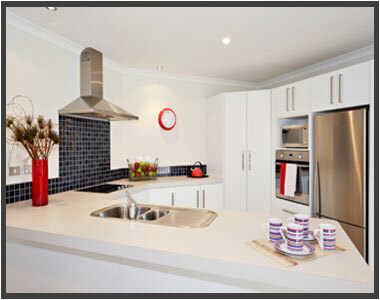 At Kitchen FX Hamilton, we design, build and manage the installation of your kitchen exclusively for you. Mark and his team at Kitchen FX pride themselves on being kitchen specialists, providing a personal service to their clients. With a dedicated team of Joiners and apprentices they produce quality custom made kitchens and joinery with a commitment to detail. As well as kitchens they manufacture laundries, vanities to the same high standard. Mark's passion is designing and manufacturing good quality, functional kitchens with individually. Mark and his team at Kitchen FX work closely with their clients and are committed to understanding their needs and providing them with innovative solutions, whilst working within their budgets. The team will make your kitchen and complete your design on time every time. With a diverse range of products now available including bench tops, doors and hardware with their guidance you will be able to choose the best options for your kitchen. The kitchen is an integral part of the home and Kitchen provide the total package from design to manufacturing to installation with a strong focus on quality and functionality. They also have a network of experienced sub-trades (i.e. builders, plumbers and electricians) which they can recommend to you. Whether you are renovating or building a new home, Mark at Kitchen FX welcome you to contact them to discuss your requirements.